Fat Bruce Lee is lousy at magnetic, office darts (not a clutch player), and he owed me lunch. The Six was pretty close to our world headquarters, so we had the corporate helicopter (OK—Harrier, but we don’t like to brag) pick us up on the roof for the short ride. The LAPD was kind enough to block traffic long enough for us to set down at the intersection of Pico and Overland. The Six occupies the old Jack Sprat’s location near the SE corner of Pico and Overland. We ordered the $10 Classic Burgers and endured the $1.00 up-charge for a slice of cheese. Seriously—they charged a buck for a slice of Cheddar, which the waitress could tell me nothing about. They have about 6 things on the menu, and the source of the beef, bun, and cheese were all complete mysteries to our waitress. We had to ask twice to discover the cut of the beef. 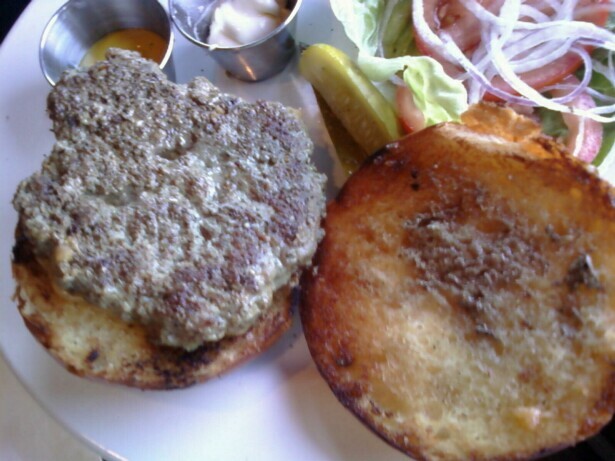 The Beef: Chuck—80:20--coarsely ground—formed into big, loosely packed, irregular, thick patties (about 7 oz.). For Chuck, this was about as good as it got. It had a nice note of aging, which complemented the dish rather than smacking me in the face and forcing me to think about how up-to-date my shots were. The beef developed a strong beefy flavor, and it even managed to provide some iron notes to round out the dish. It was a little on the greasy side, but it was also perfectly juicy, so it was worth the trade-off. The Sear: KABOOM!. The sear from the griddle was thick, savory, and crunchy. The sear was the result of a properly hot griddle and being left alone. The picture does not do the sear justice, since the burger was juicy enough to fade the deep browns visible on the top of the patty. The Seasoning: Yep—they seasoned it properly and in a way that really complemented the wonderful sear. The Preparation: I requested Medium, and I got something closed to Med-Well, but the beef was juicy and flavorful enough to tolerate the abuse. Besides, the reward was a better sear. This was a fair trade-off. It also fully melted the collagen, so the beefy flavors were able to compete with the funk. The Cheese: It was a sharp Cheddar that cost a buck and was of an origin, which completely eluded our waitress. That said, the Cheddar was flavorful enough. In spite of being a fine cheese, it was lost in the flavor of the beef and was completely unnecessary. The Bun: This was a very mild brioche bun from a local bakery (down the street). They toasted it properly. 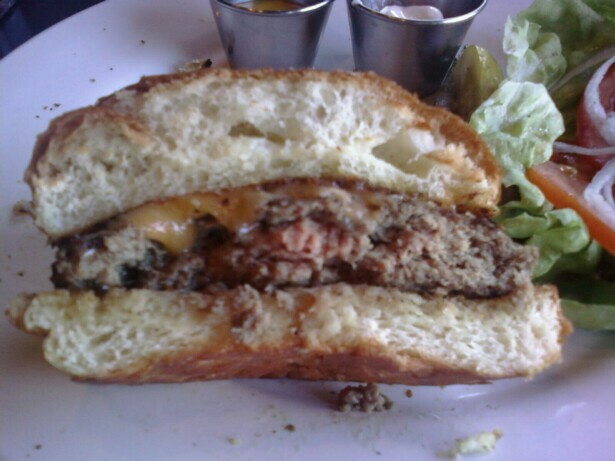 It appeared a bit daunting in size, but it managed to contain the juices of the burger while compressing to the point of becoming nearly invisible to the palate. This bun did its job proficiently. This seemed very similar to the bun at the Blu LA Cafe. Meat to Bun Ratio: Spot on. The Fries: DANGER—the fries at The Six cost 6 bucks—holy crap--$6.00 for fries! We tried the “Air Baked” and the regular. Both were good—not 6 dollars good—but good. 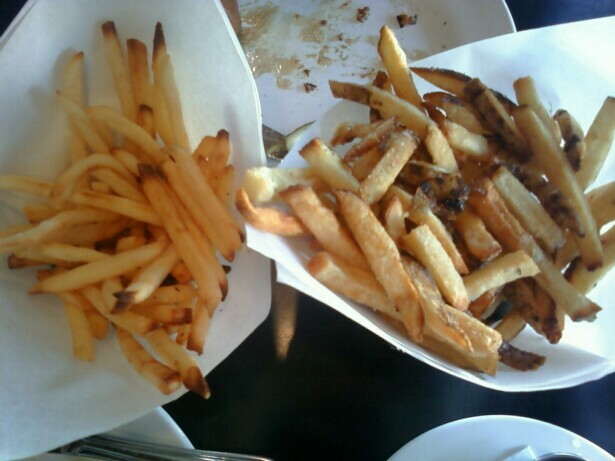 The air baked fries were especially crisp at the ends, while the regular, skin-on fries were cooked to a nice golden finish and stayed crisp even as they cooled. Did I mention that they charged $6.00 for fries? The Value: 60 bucks for three burgers, two orders of fries, and three soft drinks. A little pricey—had we avoided the fries, we would have been in the right range. Burger Review : The Six made ground Chuck taste about as good as that cut can. 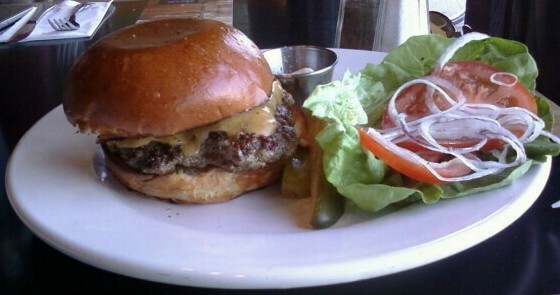 A funky, flavorful, and well-prepared cheeseburger was delivered by The Six. I had fully intended to eat only half of the large cheeseburger, but I couldn't stop. It really was a damn, fine burger. Pass on the fries. Let it be known that the "office dart" game is a cheap $10 magnetic board that is 6 inches in circumference. The darts are weightless magnets that are greatly impacted by the inter-office air conditioning wind effects. As I said...not a clutch player.